If you are struggling to start a fitness journey or spend 6 out of 7 days at the gym, Health Rewards might be just the thing for you. This incentive program gives you some fantastic rewards (no other way to say it, really) when you living your life in a healthy way. This is monitored via activity trackers or phone apps that count your steps or measure your heart rate. I am very happy to say Health Rewards have asked me to come on board as an ambassador to help let people know abut this program. They are interested in creating a community and keeping it fit and healthy. This totally aligns with my ethos as the Happiness Personal Trainer and I am happy to be a part of this family. How can you get involved? Give them a call and ask for more info. You are eligible for Health Rewards when you invest in a health and/or life insurance policy with the company. My husband and I are currently looking into a life insurance policy to help protect each other (and our mortgage). My friend, Stephen, is a huge fan and also a client. 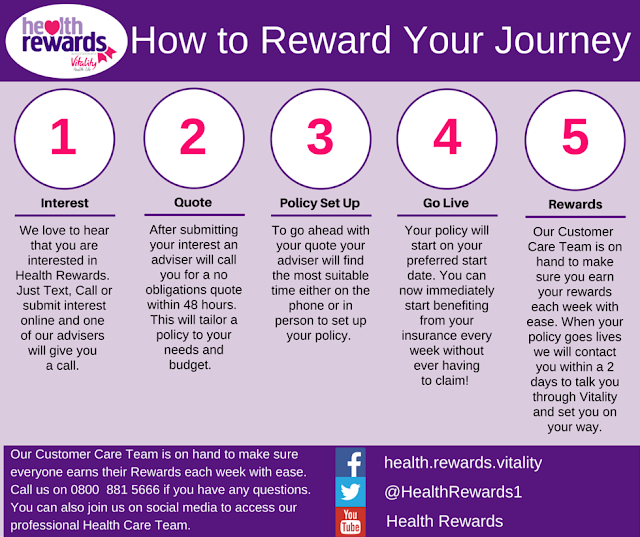 I have also spent time talking to the people at Health Rewards and they are really a lovely bunch. I will keep you updated on how I am finding Health Rewards and offer my tips on how to maximize your point-earning for even bigger rewards. Now, go out for a run.